My friend’s Marines weren’t quite the bargain he thought – as he was expecting them all to be Deathwatch figures but only two had the shoulder pads. He’s building an Ultramarine force but wanted these 6 figures done as Deathwatch. The build quality wasn’t good and too much glue had been used in places. Mould lines I could get to easily were removed, but some remain, and gaps were filled. I managed to remove 2 shoulder pads and cast copies of the Deathwatch ones to replace them but the other 2 weren’t being budged so were botched with purity seals and the like to disguise them. He also decided not to give them the silver left arm. The photos were taken to show up any painting errors before handing them over. 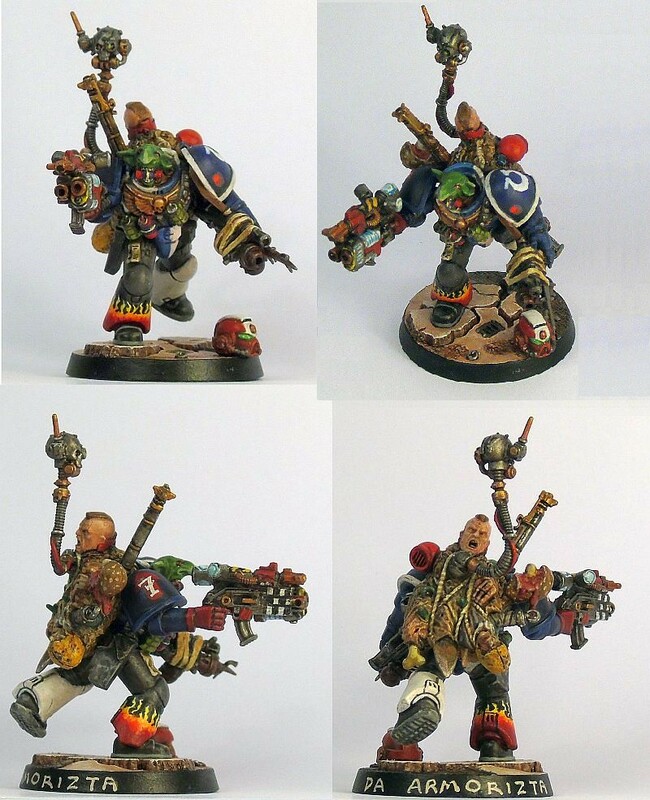 The local GW store held a painting competition based on the ‘lucky dip’ Hero Space Marines. I offered to paint one to add to my friends Ultras but as the store manager had already got him to enter I somehow ended up buying a figure to do my own entry. My figure turned out to be Brother Vanial but after I’d taken a knife and saw to the sprue the instruction sheet didn’t quite match the parts I had. With a few extras from the bits box this is the result. Some more of my friends Ultras. Not quite sure what he wanted and a lot of ideas were discussed - but most importantly he was pleased with the result. 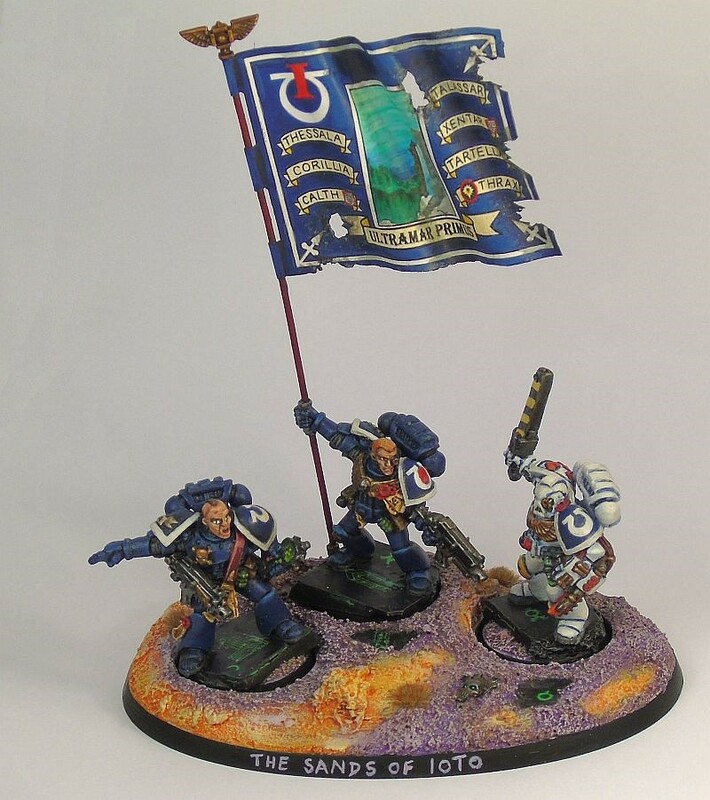 A standard was required rather than a banner and with there only being three figures no chance of recreating a raising of the standard diorama – he does intend to game with them as well – so a small scenic base for when they’re not in play. The local GW held a painting comp. for a member of a Genestealer cult. I know there have been many discussions about whether or not genestealers can infect orks but it’s in the official fluff that they can. 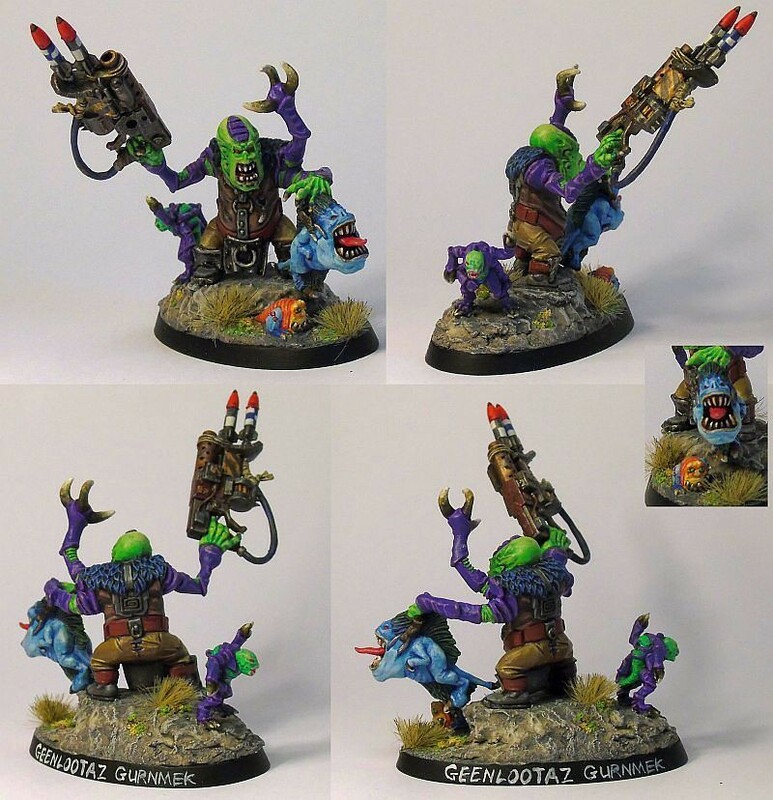 I also know of one ork/genestealer army that was started when genestealer hybrids were originally brought out for Space Hulk – this was possibly before GW showed in White Dwarf their Ork Freebooters versions. This model is a tribute to that army (where ever it may now be). Wow, quite the figure there, very impressed with the conversion and the painting is fabulous. Wondering what's the story behind the mini-orkstealer and mini squigstealer. GP – both the mini’s are from the mists of time before we were born. I believe there were many different types of the original ork squigs which were all this small but GW quickly developed the larger space hopper ones and these are the only type that have remained (plastic has also increased their size). This is a resin copy. The other was a familiar for a genestealer Magus back in the 80s. Really amazing work, that piece tells a story. The final set of my friends Ultramarines. 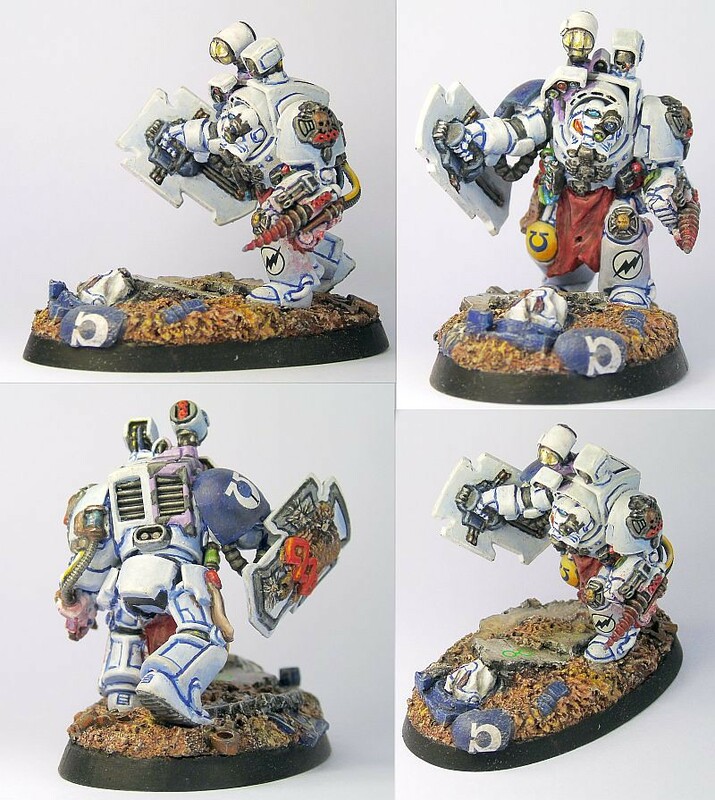 It started as one pack of 5 Terminators, and then he wanted one converting into an apothecary but it took him months to get the extra parts – by which time he decided he needed a second box. I found it difficult to make 5 realistic poses with this kit, so 10 was near impossible. Also I can’t find any mention of corporals in the marines but created one so that he could use as two groups of 5 if he wished without it looking as if he had 2 sergeants in a 10 man unit. I wanted the apothecary to be kneeling down but couldn’t get the legs to look right. If you have noted that there are 11 men from 2x5 boxes you are doing better than he is as I don’t think he’s realised yet. The Apothecary certainly has an attentive pose, and the vignette has great focus. What do you mean 11 men? Did you build the apothocary from parts too? I see there is a base with some equipment on it... maybe I am missing something? I was eventually given 10 men, the medic's arm, bottles and lights. I later picked up a 30p terminator from a junk box at a show and planned to use it for the base. Then on one of my update pictures I jokingly added a Necron shield to his corporal which he liked and so it remained. Now I had a spare hammer and shield and the spare bits from the kits to fit on the junk terminator body. After making a cast of this body for the medic's base it just needed a few GS sculpts for repairs and updates and now it’s hard to tell that it was an earlier version. My friend gave me 10 figures – I’ve returned 11 and he’s still not commented on the extra man. You made it look good though! Many years ago I repaired and painted up the entirety of one of my friend's O&G armies. I added a bunch of figures from bulk internet purchases, and ultimately I got a O&G army the same size as the one I was repairing / painting. Well, he actually got a second Giant, extra Chariot (Grom the Paunch) extra wolf and spiders riders and Night Goblins out of it. Besides being overwhelmed (because it was a Birthday surprise) he showed a bit of gratitude, but I'm not sure he truly appreciated how much he got out of it. Regardless, I got the pleasure to finally play against a fully painted enemy army!